During my last several trips to the Houston, off of Richmond, on Saturday mornings. I have fallen in love with this Pimento cheese spread. What makes this spread special? This is a creamy spread that tastes nothing like the grocery store variety that you normally find, this is the kind you want to serve at a party. 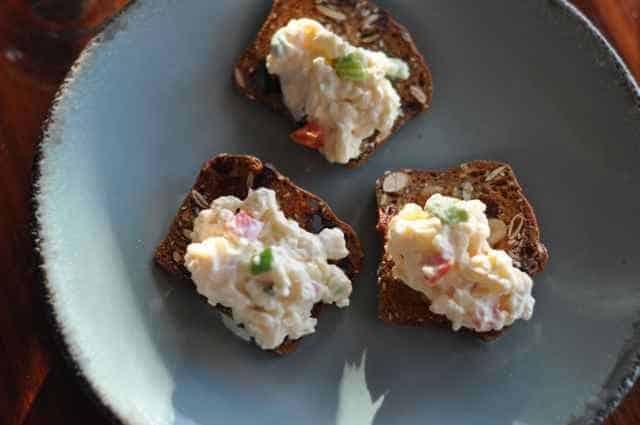 I love this pimento cheese spread, it isn’t orange like you find in a grocery store, it is white and creamy, and packed full of flavor. I have enjoyed this on crackers, or even on an open-faced sandwich lightly toasted in the oven. Fresh ingredients make all of the difference. This sandwich is flavored simply, with red and green onions, and a touch of black pepper. White cheddar cheese may not be crucial to this, I imagine other cheddars would work well. I have made this Kerry Gold White Cheddar cheese and loved this pimento cheese spread. I hope you enjoy this as well. Now if you can get to the farmers market in Houston, be sure to stop at this lady’s booth, she also has some lovely Meyer Lemon hummus! Discovered at a local farmers market this copycat cheese spread is a quick and easy cheese spread to make. In a medium-sized bowl grate cheese, and stir in mayonnaise. Add chopped red onion, chopped green onion tops, and black pepper and stir together well. Drain the pimento pepper slices very well, you do not want them wet with their liquid when you add them to the salad, this will discolor your salad. Stir in pimento peppers gently. For the best flavor let this rest overnight in your refrigerator before serving. This will last for about 1 week in your refrigerator. You may want to serve this with crackers, bread, or even crisp celery. Other wonderful stops at this farmers market at the local food vendors, there are some incredible taco trucks that stop here in the morning! Melissa, your version sounds very tasty. Thank you for adding your suggestions. I moved to New England from Houston and miss this farmer’s market pimento cheese so much. My mother in law gets it for me every time I visit. I was thrilled to find this recipe. Now I can make it and have a little slice of Houston in my home. I added a dash of lemon juice and I roast my own red peppers instead of using jarred pimentos. Thanks for the recipe. What type of bread is this spread served on in the photo? It looks like a nut bread and looks delicious! i believe this was some sort of cracker. My guess is those crackers came from costco. Costco and the farmers market go hand in hand for me. This is almost identical to the recipe for pimento cheese that has been in my family for generations! I have a cousin who adds a little shredded dill pickle and diced pecans to it. I can’t eat any other pimento cheese. I’ve also tried it with a combination of cheeses for variety. Pimento cheese is on my “Bucket List”, if I eat it, I will “kick the bucket”!!!!! We all have those limits! This is absolutely fabulous! I took this to a ladies luncheon and they raved about it. Everyone is asking for the recipe! It is so good!